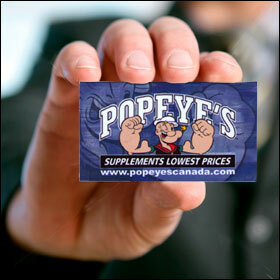 Popeye's Supplements Canada Gift Cards can be redeemed at any of our Retail Store locations. Click on Store Locator for a listing near you. NOTE: Gift cards are for retail store only and cannot be used for online purchases. Popeye's Supplements Canada Gift Cards can not be used for online purchases.